Meet Qalandar Khatana: a shepherd and guide by trade in 1991, living in the village of Kalroos Moori Kothiyan in the north of (Indian held) Kashmir. When I first met him, it was not fear but resignation that I saw in Khatana’s eyes. Resignation over what he had suffered, over the ensuing helplessness, and over never being able to heal from the scars of trauma. Khatana was among the civilian men caught during the 1990s by the Indian forces, at the peak of government efforts to quell the Kashmiri insurgency. He was accused of being a guide for militants who came from across the border (from what Pakistan refers to as Azad Kashmir). On mere suspicion, he faced third degree torture by the Indian Border Security Force (BSF) and the infamous Special Task Force (now Special Operations Group) of Police. Khatana was left crippled for life. He now begs for a living. Khatana recalled how he was transferred to nine different BSF camps for questioning; in each camp he was tortured afresh. First he was stripped and hung upside down, and then the interrogators took a razor and made tiny cuts all over his body. Bleeding and in pain, he howled for mercy but there was no respite. Salt and chilli powder was applied to his wounds. Wires were then rigged to his body, mainly to the genitalia and the eyelids. He was then electrocuted. Torture was often followed by starvation and ritual humiliation. He was not given any water and instead was urinated upon by his captors. Hungry, he begged for food but none was forthcoming. Shocked and disturbed, I asked him why they subjected him to this kind of brutality. “Because they were getting no answers, because I did not know any of the men I took across the border, let alone their names. What could I tell them? Under extreme torture, I remember shouting out random names, anything … just anything to make the pain stop”. Khatana’s ordeal was far from over; from here he was shifted to Jammu prison — one of the most feared torture centres of the 90s, with plenty of tales of beating and horror entrapped within its walls. The warden in particular was infamous for his cruelty. I asked him if any medical treatment was given to him after the amputation “What medical attention? People tell me I only regained consciousness two weeks later. 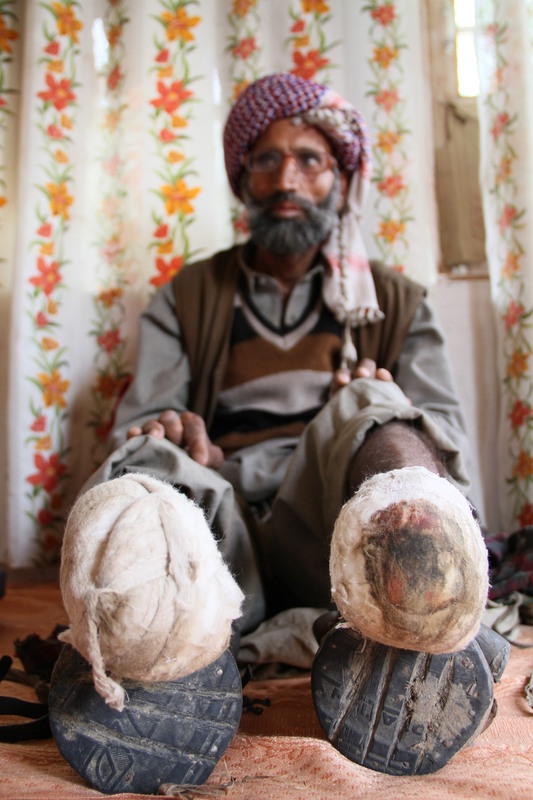 It was hell.” Khatana was then shifted to the army hospital in Badami Bagh, Srinagar where he remained for a few weeks. He was then sent to Kot Balwal prison, where he languished for another four years. Upon his release, Khatana’s case was taken up by the Jammu and Kashmir Coalition for Civil Society (JKCCS), an NGO that is headed by leading advocate and human rights activist Parvez Imroz and others. A subsequent government investigation acquitted him of all charges, and condemned the torture that was inflicted on him. However he was only awarded Rs50,000 in compensation for his ordeal. That paltry sum quickly ran out, and much of it was used for treating his amputated feet which had developed gangrene and other infections. An NGO in Chandigarh paid for artificial limbs 15 years ago, but now the limbs have worn out. Khatana now gets around on crude crutches made out of wood, and for his limbs there is nothing but plastic sheets covering the stumps. “I lost my feet and eyesight. I don’t earn any money, and at times my children don’t have anything to eat. My children were studying in a local government school but they dropped out because I couldn’t afford it,” he laments. Every few months, he takes a loan to come to Srinagar, and to plead with the lawyers at JKCCS to help him get a little more compensation. Sadly, there is nothing more they can do. In 2012, there were calls for the repeal of the Armed Forces Special Powers Act (AFSPA) — a powerful piece of legislation in force in Jammu and Kashmir and the northeast of India, which allows soldiers to carry out operations without fear of prosecution. To an extent, this in understandable; but the AFSPA also shields soldiers from prosecution against human rights abuses. To date, not a single soldier has been prosecuted over human rights abuses in the Kashmir Valley. But for men such as Qalandar Khatana — turned into invalids on mere suspicion by the same law — to be tortured is to know absolute helplessness. Hope is ground into the dust, blow by heavy blow. Source : Was originally published on March 02, 2014 on Dawn/Gautham Ashok.